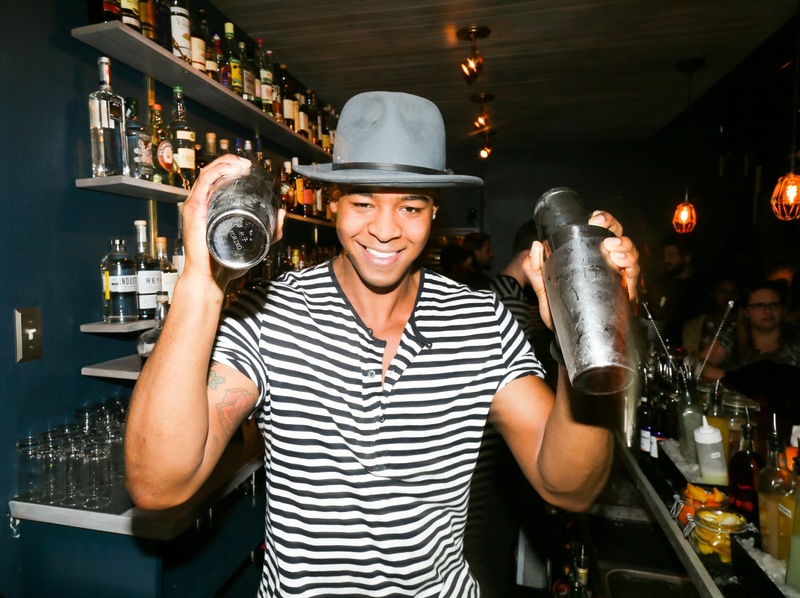 Courtesy Photo of Brandon, one of Dullboy's bartenders. Coincidentally, I'm in the background. How do you know a neighborhood/ city has "made it"? When it gets its own craft cocktail bar. I guess that means Jersey City is really on the map now, thanks to Dullboy. Located less than 2 blocks from the Grove St. PATH station, the bar promises fine foods and "boozing done better." After spending an evening tasting and tippling, I'd say their word is good. Here are a few of my favorite cocktails there (disclaimer: I'm biased in favor of bourbon and other whiskeys when temps are below 65 degrees). An absinthe washed glass + rye whiskey + bitters + a special housemade syrup = a well-balanced drink that's strong, a little sweet and great for taking the edge off after a crazy day. If Brandon's behind the bar, and it's not a crowded night, ask him for something special. I requested a cocktail with whiskey, ginger and pineapple. The result was delicious. I don't often enjoy drinks that aren't spirit-forward, but this one was GOOD. As in a guy who enjoys sweeter drinks can order it without getting a side-eye, and girls who are used to apple martinis can enjoy this without looking like they take drink cues from repeats of the Jersey Shore. The grub here was great, as well. I strongly suggest trying the avocado toast. Poached lobster. Lump crab. Need I say more? Oh, and on Mondays there are $1 oysters. The crowd, from what I saw, is a pretty eclectic mix of professionals, creatives and "cool kids". If you're looking for a dive bar, this isn't the spot. This also isn't a place to go for shots! shots! shots! A friend commented to me that the drinks take too long for him, but I reminded him that a good cocktail isn't made in a hurry. I'm happy to sit and make new friends at the bar while the bartender makes sure that the ice in my drink provides the ideal level of dilution. If you are to... Go. Enjoy. Tell 'em I sent ya!